Carved out of a mountainside, this site is one of the most dramatic of all the temples built in Egypt. It Consists of two temples, the smaller temple, dedicated to Hathor and Queen Nefertari, has been visited by travellers for centuries. 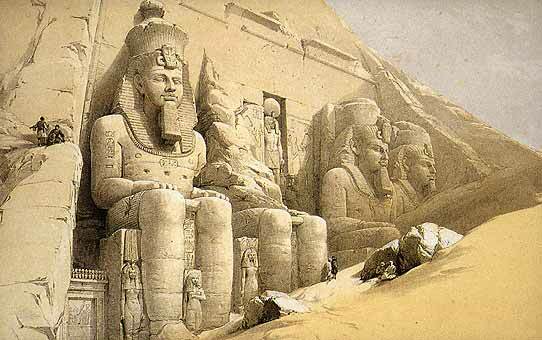 The Great Temple has been hidden by sand for centuries, it was not rediscovered until 1813 by Jean Louis Burckhardt (a Swiss explorer), the first to enter the temple in modern times was Giovanni Belzoni on 1 August 1817. Surrounding the entrance doorway to the temple are Ramesses II's cartouches, figures of gods and scenes of Ramesses II before Amun-Re, Mut, Re and Werthekau. Above the doorway is a figure of Re with a jackal headed staff (User) and a figure of Maat, above these figures are 22 baboons. Inside the temple, the corridor extends 160 feet into the mountainside, ending at the sanctuary. The Great Temple also has an account of the Battle of Kadesh - it covers an area fifty feet long by forty feet wide and consists of thousands of figures.